The big slosh has begun, and the consequences could be disastrous. Hurricane Florence's leading edge battered the Carolina coast Thursday, bending trees and shooting frothy sea water over streets on the Outer Banks, as the hulking storm closed in with 100 mph (155 kph) winds for a drenching siege that could last all weekend. Tens of thousands were without power. Florence's winds weakened as it drew closer to land, dropping from a peak of 140 mph (225 kph) earlier in the week, and the hurricane was downgraded from a terrifying Category 4 to a 1. Hurricane Florence is bringing heavy rain, high winds and flooding to the Carolinas. But officials and forecasters urged residents in the storm's path to not be deceived by the category downgrade. "Do not pay attention to the category. That's not the important thing," said NBC News' meteorologist Al Roker. "The storm surge — this is the most dangerous part of the storm." 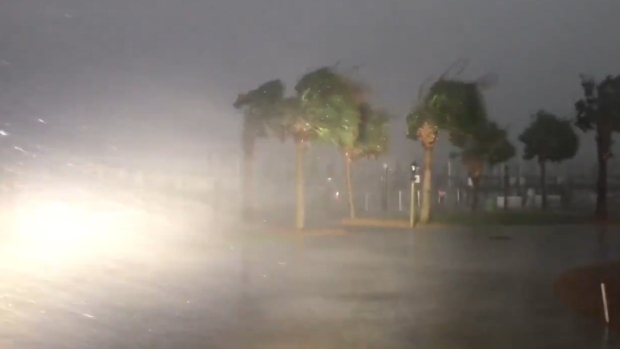 Flooding is the deadliest factor in hurricanes, both from storm surge and rain, and Florence is set to bring a lot when it makes landfall late Thursday or early Friday, NBC Connecticut meteorologist Kaitlyn McGrath said. "You're talking about an enormous wall of water just pushing onshore," likely through multiple high tide cycles, she said, adding that the feet of rain set to fall inland will have a hard time draining. "The National Weather Service has been referring to this as the storm of a lifetime for the Carolinas, and for good reason," McGrath said. North Carolina Gov. Roy Cooper warned: "Don't relax, don't get complacent. Stay on guard. This is a powerful storm that can kill. Today the threat becomes a reality." More than 80,000 people were already without power as the storm approached, and more than 12,000 were in shelters. Another 400 people were in shelters in Virginia, where forecasts were less dire. Airlines canceled over 1,400 flights through Saturday and counting, and some airports in the Carolinas virtually shut down. Schools and businesses closed as far south as Georgia. Home Depot and Lowe's activated emergency response centers and sent in around 1,100 trucks to get generators, trash bags and bottled water to stores before and after the storm. The size of Hurricane Florence, at 630 miles across, is comparable to 2017's "monster" Hurricane Irma. Irma measured approximately 400 miles across, according to NBC meteorologist Katilyn McGrath, while Katia came in at 70 miles wide. Measurement refers to area size impacted by hurricane-force winds. Satellite images courtesy NOAA. Government officials and residents along the Atlantic Coast are preparing for massive Hurricane Florence by gathering supplies and boarding homes. At 12 a.m. EDT Friday the storm's eye was about 45 miles (70 kilometers) south-southwest of Morehead, City, North Carolina. The core was also about 50 miles (85 kilometers) east of Wilmington, North Carolina. The storm was moving to the northwest at 6 mph (9 kph). This map shows how high the storm surge from Hurricane Florence has a 1 in 10 chance of reaching, measured in feet above ground and with the tide. Click a location to see the possible storm surge height there. Data valid from Sept. 14, 7:00 a.m. EST to Sept. 18, 1:00 p.m.